Today saw a first round win for badminton player Nhat Nguyen in men’s singles, as well as first heat wins for Mona McSharry and Niamh Coyne in the Women’s 50m Breaststroke event. 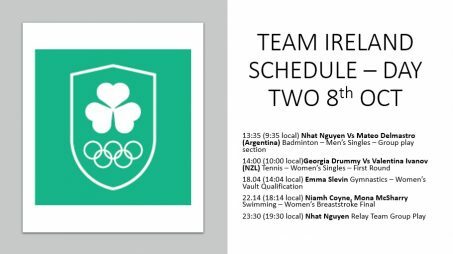 Dubliner, Nhat was the first Irish in action this morning in the Badminton singles where he met Kettiya Keoxay (LAO) in the first round. Nhat took control of the competition, winning with an overall margin of 21-11, 21-6. Later in the day Nguyen competed in the team relays. The badminton relays are a new concept for the Youth Olympic Games, with athletes competing in a number of different categories. The format is shorter than normal with the players competing to 11 points. Nguyen paired with Great Britain’s Christopher Grimley to win in the men’s doubles, and with Hungary’s Vivien Sandorhazi in the mixed doubles. Performance Director John Quinn spoke about the team relay and Nguyen’s Expectations. In swimming, both Mona McSharry (Sligo) and Niamh Coyne (Dublin) moved comfortably into their semis after winning their respective heats in the women’s 50m breaststroke. McSharry progresses as the second fastest swimmer, with a time of 31.78 and Coyne fifth fastest overall with a time of 31.9. Both Niamh Coyne and Mona McSharry will compete in the finals of the Women’s 50m Breaststroke, following strong performances in the semi finals tonight. Coyne moves into the final as 4th fastest qualifier, with a time of 31.80, McSharry is 6th fastest with 32.01. Dublin’s Georgia Drummy and her Georgian partner, Makatsaria, went out in two straight sets to Japanese pairing Naito and Sato. Despite losing the first set 6 games to 1, the Irish Georgian pairing began to dominate in the second set, and were very unlucky to go out 6 games to 5 to their Japanese opponents. This evening will see Nhat compete in the badminton team event, which is new to the schedule for the Youth Olympic Games, promoting Olympism and its core values of friendship and respect. Paired with players from other countries, the athletes compete in doubles, playing to 11 as a pose to the usual 21. Meanwhile, tonight, Mona McSharry and Niamh Coyne will compete in the semis of the women’s 50m breaststroke with the view to getting through to tomorrow’s final. 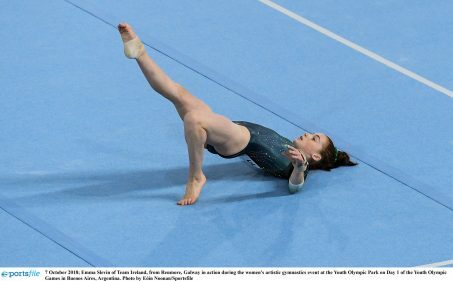 Day two of the Youth Olympic Games will see Emma Slevin in action in the women’s vault, while Nhat Nguyen will take to the court once again in the group play stage of the Men’s singles. Georgia Drummey will play the first round of the women’s singles with the women’s 50m breaststroke final also taking place with two final hopefuls in Mona McSharry and Niamh Coyne. Team Ireland in Buenos Aires comprises of a squad of 16 athletes from 9 sports. The team of 5 male athletes and 11 female athletes includes Nhat Nguyen (Badminton) and Mona McSharry (Swimming), recipients of Olympic Solidarity Scholarships which were awarded to assist with qualification and preparations for the Tokyo 2020 Olympic Games. This is the third edition of the Youth Olympic Games which are hosted every four years. The Games, running from October 6 to October 18 will feature more than 4,000 talented junior athletes aged 15 to 18 from 200 countries in over 32 sports.